My daughter said she really enjoyed the peanut butter sandwich from her last lunch and asked if she could have another one the next day. I said sure and decided to use one of the cutters from my heart set. These cutters are from Willams Sonoma. They have a heart shaped cutter on one side and phrases on the other. I selected the XOXO press and then used food safe markers to accentuate the letters. Sticking with hugs and kisses them, I included a lip pick, heart picks, and an XOXO pick. 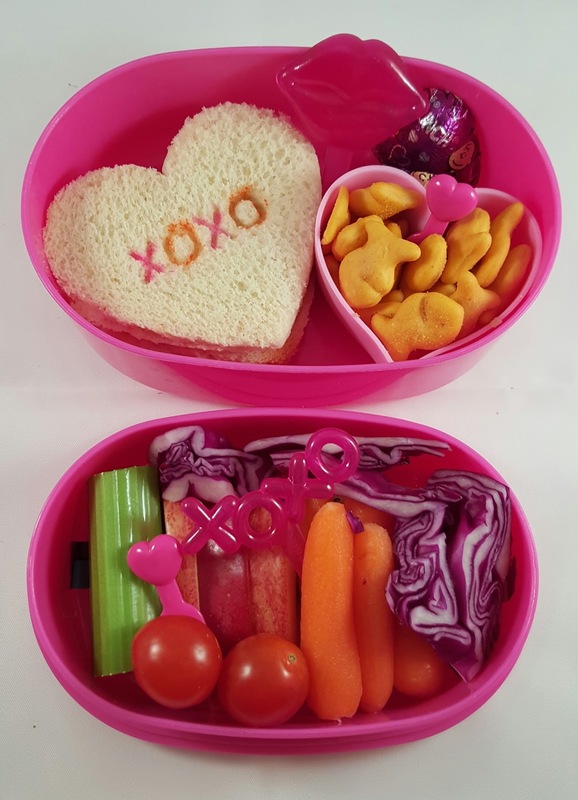 I chose this pink two tier box for this lunch partly because it was pink, but also because the style allows me to pack the sandwich in one section for storage at room temperature overnight while the other foods can be placed in a separate tier in the refrigerator. 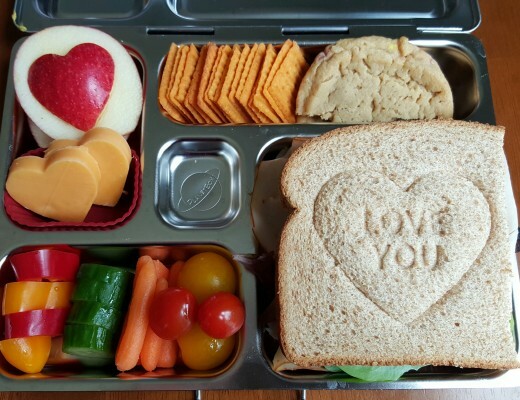 My daughter likes the peanut butter sandwiches better this way. 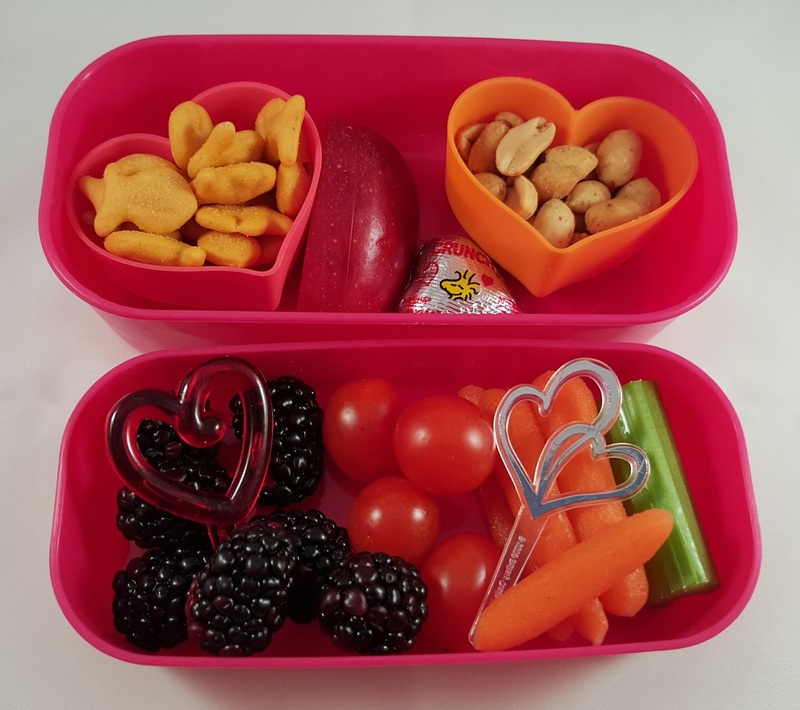 I used hearts for my son’s lunch in a different pink two tier box. 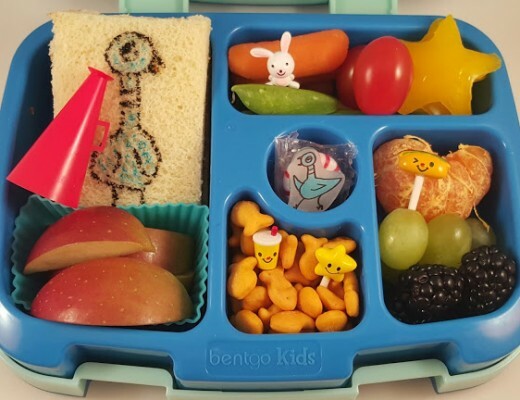 He has mini heart-shaped silicone cups filled with Goldfish and peanuts. He has a lot of blackberries because he loves berries, and then several veggies. I added two different heart picks to those to keep with the love theme. 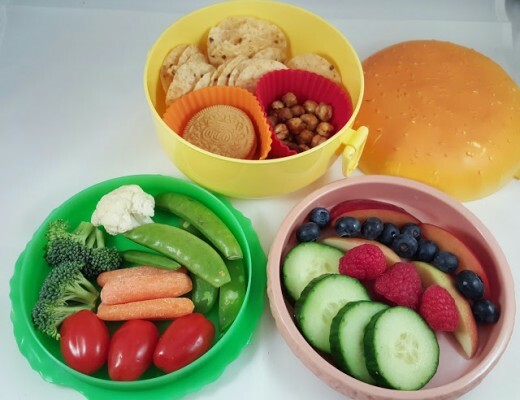 He will have yogurt along with this food for lunch. A Lunch Inspired by Mo Willems’ Don’t Let the Pigeon Stay Up Late!